First seen asteroid from another solar system: oumuamua in depth. I am Hans Bergman, used to work for two years as cable man for Liberty Global (Vodafone-Ziggo Netherlands) now looking for a job, primarily writer and researcher explaining the fusion rocket of the future which came from the distant past as a memory engraved on a Maya tomb. 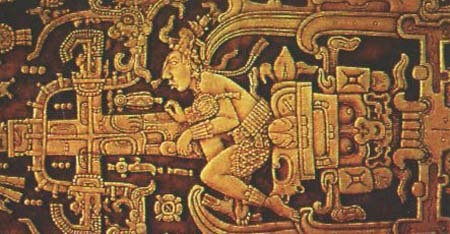 The development of this fusion rocket is based on paranormal (clairvoyant André Groote), archeological (image on a cover plate of a Maya tomb) and scientific (S-1, S-2, Spheromak fusion machine of the Princeton Plasma Physics Laboratory) information. It is a virtual fusion rocket which will fly in the future when fusion technology will be more understood (and developed) by the modern scientific world and science fiction becomes science. My technical paper of the fusion rocket was published in Fusion Technology 1988, Proceedings of the 15th Symposium on Fusion Technology, Utrecht, the Netherlands, 19-23 September, 1988, Volume 2, A.M. Van Ingen, A. Nijsen-Vis, H.T. Klippel (editors). Subtitle: Modification of the practical lightweight spheromak results in a fusion rocket for interplanetary spacetravel." Published by Elsevier Science Publishers BV, copyright Hans Bergman © 1989-2016. My paper was published under "Reactor Studies". Amazingly I noticed in the next Proceedings, the Proceedings of the 16th SOFT in 1990 in London (UK), that scientists introduced a new item "Future Machines". In the publication of 1989 you can still see my old address, but I have moved to a new address. I have dubbed the new fusion rocket in the publication Palenkomak since the tomb is situated in Palenque. My discipline (diploma 1982) "Nuclear Engineering Technology": correspondence school Capitol Radio Engineering Institute, Delaware, USA. (Published in 1979, Kasskara und die Sieben Welten) According to Hopi Indian White Bear Fredericks (passed away), we are now in the fourth world. Our people had knowledge which can be compared with people from Atlantis, but they used it for good purposes. We discovered the secrets of nature, the power of the creator in the living things. They did not defend themselves when they were attacked. And they were right! When you think this is strange then look at what the Hopi do today. The United States of America gave us a reservation. Imagine, how can they give something which already belonged to us? Then they came and cut a peace away. They made it smaller and smaller. Our land! But we did not defend ourselves with violence. Every time when the government is doing such a thing, we say: "That is not right", as our creator demanded from us. We know we will not be destroyed, it will happen to them first. The government gave land to the Navajo, while it actually was land of the Hopi. So the Hopi experienced three technical civilizations. They have a timeline of what will happen in a technical civilization called Dangave. Akhima who is not Hopi, however, will explain the drawing of a rock inscription called Dangave. Personally, I think, after hearing the discussion between Ahkima and Fieldworker Ron Slusher Sr. in this video, that the timeline contains the first vibration as the discovery of the nuclear bomb, the second vibration will be the discovery of a new bomb still unknown to us and the third and last vibration comes from above. The earth shakings are not wars, but they represent discoveries of two bombs. The first is the discovery of the atomic bomb, the second bomb lies in the future since the Dutch clairvoyant André Groote said to me they will discover new particles, the smallest particles that exist, calling them futurons. The third earthshaking comes from above, which means from space. These earth shakings apparently will be part of a technologically developing advanced civilization on this planet in our Solar System. Therefore the Hopi Elders (Hopi Evehema) were warning not to use the gurdle of ashes as they remembered it from earlier civilizations when the US government used the atomic bomb. IMO the planet near the reed is Mars or Earth and the cross means a space station with 4 tubes while all the tubes can turn to one side changing the space station into a movable space station so that they could move people from Mars to Earth. I also found such a Space Station on a rock painting in the Sahara. André Groote: "About 50 years from now (now is 2004-2005) they will discover this new element. The principle has to do with a neutron bomb, first an implosion, then that unknown element is made and then an explosion will follow. This bomb could fit in the shape of a walnut." Before I studied the fusion rocket on the tomb I asked permission in my mind if I could proceed since I only want to be involved in positive technology. I dreamt about a North American Indian with Indian feathers who offered me a peace pipe and I smoked the peace pipe and handed it back to him. For me, this was the approval I needed to proceed with the technology of the fusion rocket. I found out in 1975 that the space cabin existed out of a two-layered cabin wall and a double wall. It could be that it was for the protection of collisions of small particles, but also for fuel storage. For instance, airplanes store fuel in their wings, why not in the outer space cabin wall. Then there was engineer Lazlo Toth (born 1945) from Hungary who proposed to reduce Pacal as the posing astronaut in his chair. So I compared the space cabin of Pacal with the space cabin of astronauts in the Apollo cabin. I found out that the cables (leading to a handle) of both chairs could be identified. The actual handle probably is in his hand, because I can't see the handle, but I can see the cable connected to the handle. Even the extension at the bottom end of the chair is identical with an ellipse-shaped connection? in it. Both Pacal and the Apollo astronaut turn a knob. In front of the nose of Pacal we see an air supply. The air supply in the Apollo cabin can be seen at the top right. In space, the knees and elbows tend to bent and the head is bigger since there is no gravity to pull the blood downward. So let's start the research, shall we? Since fusion machines in spaceflight should be lightweight and small we should look for next-generation Spheromak S-1 fusion machines, like the MRX and especially for the future the Palenkomak for faster transport of passengers and goods in our solar system. Some background information about the discovery of the tomb: National Geographic Live! - Palenque and the Ancient Maya World. In this video archeologist professor David Stuart says that "it is not true that Pacal is falling into the underworld, he is rising in the east as the newborn son, as the newborn maize god." So it is a mixture of the royal funeral of Pacal ascending in a spacecraft expressing a space message. The problem here is which glyphs are concerned with the funeral and life of Pacal and which are concerned with the distant memory of the fusion rocket and past situation of the solar system. His son and grandsons must have lost the space message as a technology since they put the rocket out of proportion and put it in their temples. If we change the word underworld into the word space perhaps things will be more clear to us, so only in this case if something comes from the underworld it actually comes from space. So if the Tree of Life comes from the underworld it comes from space. The drawing on the slab is the original design of a fusion rocket level A. I would call derivations of original drawings level B what happened in the Temple of the Cross. When it becomes level C the original drawing is lost and becomes art. However, if you find and recognize a B drawing there must be an A drawing somewhere. I say Pacal's ascension just happens in a fusion rocket! A great way to go! I have some experience with both possibilities. I have back-engineered the fusion rocket in my paper and in a vision I also have seen the fusion rocket fly and I can say the numerous plasma exhaust flames are perfectly conical in shape with here and there an outlier, nothing like the exhaust flame of chemical rockets. While nowadays students begin to appreciate multidisciplinary research I was already doing that in 1988. I checked my idea of the mixed exhaust with spaceflight professor Harry O. Ruppe (who worked in the Apollo program) and a clairvoyant André Groote described the inner workings of the plasma ball in the fusion machine and he saw magnets in the bow of the rocket. Clairvoyant André Groote saw in the plasma "opposite rotating (elliptically shaped) electron currents will create opposite magnetic momentums. The number of revolutions of the elliptically shaped electron currents determines the final stability of the plasma." (see publication). He added even before 1988 that "Scientists must work in the width because until now they have only worked in the height." (remark: they have applied it in the current MRX where two small plasma donuts are pushed sidewards towards each other by two modified S-2 machines in one configuration). I was thinking out of the box because without the explanation of the inner plasma I only would have made a statue. Why are there no external heating apparatus to heat the plasma? The answer is that the opposite elliptical electron currents cause friction or heat inside the plasma ball! At the beginning of my research in 1982 I worked with drawings of the fusion rocket and I assumed that the object in the plasma with the crescent cross-section (in the shape of a thick scale) was a "limiter". I had to use current available technology so I published it in 1988. In the meantime, I have progressed with new plasma discoveries. According to the earlier understanding images of the plate (my first impression was that the crescent in the plasma was a limiter with the knowledge that was available and in my progressing opinion it could be a crescent hole in the plasma, an empty region instead of a thick scale in the plasma. A special region in the shape of a scale, more dense or empty, but a special region. The drawing of the fusion rocket remains the same. However, the limiter could be changed into a less dense or a more dense region in the plasma. The idea of a special region in the plasma came in 13-4-2012, when I realized that we learned from clairvoyant André Groote that there are opposite elliptically shaped electron currents (according to the Yin Yang-principle creating balancing opposite momentums) so we already know the final result of the opposite ellipse shaped electron currents in the plasma, creating heat by friction, but the scientist from Atlantis assumes that we don't know. So it could very well be possible that he or she (the engineer from Atlantis) wanted to give us a clue by creating a specific region in the shape of a crescent in the plasma, which could belong to a special computer simulation of the plasma belonging to the fusion rocket configuration of the predicted opposite elliptically shaped electron currents which according to the right number of revolutions will cause the appropriate opposite magnetic momentums to confine the plasma in perfect balance (according to the Yin-Yang principle which according to Andre Groote can also be seen in the spirals of stars of our Milky Way system). In 2015 PPPL discovered something inside the MRX plasma which they said was a region with the shape of a saddle. This saddle shape, however, appears in a configuration of two donut plasmas coming together and not our configuration of a donut turning into a ball shape actually done for the stability. I think that the plasma ball is better for stability since the created heat and pressure will have an effect. In an unstable plasma like a donut, it will not have an effect. Stability of the plasma is the key as I told the scientists at the conference in 1988. Even our sun which is a natural fusion reactor has the shape of a ball I said, only in the fusion rocket we create a small ball-shaped plasma which heats itself and is stable. I think that the electromagnets in the bow of the rocket were used to create a magnetic shield around the spacecraft protecting the astronaut, the magnetic field lines transport the incoming particles from the solar wind around the spacecraft creating a layer of particles. The first glyph looks IMO like a solar wind, the second glyph looks like a cross meaning oppose or against and the third glyph is a shield. It is obvious that Pacal's name was connected to a shield. However, his real name is K'inich Janaab Pakal. I am not a glyph expert and don't know if Wikipedia is correct, but I see three glyphs which seem the same in both K'inich Chimal - Pa Ka L(a) (internet) and supposedly named as K'inich Janaab Pakal (Wikipedia). So Pacal's shield faced the solar wind... or Pacal was protected from the solar wind by a magnetic shield. The solar wind glyph looks like a small symbolic magnetosphere representing the solar wind (source picture K'inich Janaab Pakal Wikipedia). I don't say that Pacal was an astronaut, but he certainly had found knowledge about spacecraft perhaps from a vision or a distant memory of a spacecraft fleeing from Mars to Earth planting new seed on Earth. Our astronauts are still unprotected from the solar wind and violent solar outbursts during the end of the 11th year cycle of sunspots. Also the Dutch astronaut André Kuipers made a remark in his Ontdek de Ruimte - met André Kuipers (NTR) that people are not protected against radiation in space. Clairvoyant André Groote saw that the atmosphere of Mars in the distant past was sucked away by the passing of an asteroid at close range. This threat came from outside and he sees that the atmosphere was gone at once. They knew in advance that the asteroids where coming and accordingly they fled from Mars to Earth. Between 2025 and 2032 a group of asteroids will appear. A number of years before the different groups of asteroids (really giants) will appear they will cause unexplainable flood waves with no sign of an earthquake (in China), because of the gravity of the cosmic storms per timezone. So the influence comes from outside. Many years ago these dangerous giant asteroids passed by and every 3500 or 35000 years they return like a zig-zag movement in a circle. Alaska could be hit by such asteroid. Or Africa in between the Sahara and the Niger. In the triangle Algeria, Mali, and Niger they hardly can be stopped because of their abnormal orbit. The rhythm is a scheme of impacts with every week one or two asteroids per timezone. This seven weeks long and one a week, so I call it “The Weekly Impact”. A New Vision for Fusion Energy Research: Fusion Rockets for Planetary Defense by G. A. Wurden, T. E. Weber, P. J. Turchi, P. B. Parks, T. E. Evans, S. A. Cohen, J. T. Cassibry, E. M. Campbell, for the Journal of Fusion Energy, LA-UR-15-2319 Ver2, May 2015. This article from PPPL scientist Yamada about MRX, the offspring from the Spheromak prototype research leading towards the MRX and recently the FLARE research. The new FLARE project (The Facility for Laboratory Reconnection Experiments) achieved first plasma in 2018. Question is why not making the fusion machine smaller instead of larger. Why are they neglecting my proposal since 1988? We first have to create a stable plasma according to the scheme of the Palenkomak! FLARE only is a bigger MRX. Why are these scientists so ignorant? Why do scientists not follow my "stability first" principle that is from "donut" to "ball" shaped plasma I presented in 1988? UFOmania with the computer voice, in this case, has a point, since there is a cave painting! Should I use crowdfunding to find the hidden discs in China? I know these discs with spirals are still hidden in China since clairvoyant Andre Groote told me he had a dream about the interior crystal storage in the discs using multilayer storage of quartz particles in granite to last for centuries. The technology is too complicated for our current computers. He warns that laser light can erase the discs forever, so we must produce a listening computer device to hear the ticking information. However, our current computers can't listen to the discs yet. Andre Groote says that UFO's can appear as a cigar shape which is the mothership. And the UFOs can quickly appear and disappear. Aliens use telepathy to be able to investigate our planet and the materialization of a UFO, therefore, is the result of telepathy. The projection of opposite telepathic cone-shaped spiral waves from an alien towards someone on our planet can create a UFO which appears and disappears instantaneously. Seen from the alien point of view we are aliens compared to them, so if you want to see a real alien, look into the mirror! No wonder a guy told CNN he didn't believe scientists any longer about neglecting ufos when he saw one. Only saw the announcement by CNN, but was too busy therefore missing the whole item. However, I saw one in the cave painting above. Monstrous Blackhole in the Milky Way nice if they study this, but what about choosing nearby stars or planets as a source of propulsion? Andre flew in a dream in a UFO and explained to me the UFO and told me about the magnetic propulsion of the UFO and that the two plasma engines in each UFO scale, again in opposite conjunction to each other projecting into the core of a chosen planet and oppositely projected towards the earlier measured two magnetic poles of the planet, both fusion machines exist out of two opposite turning plasma balls, again in opposite conjunction to each other, linking it to the QM Transactional Interpretation by John Cramer at the Aerospace Advanced Propulsion Workshop 2017. When we have a flyby near a planet we just turn the two fusion machines 180 degrees, so that the planet is now pushing instead of pulling. We can hop from planet to planet and also use a pattern or grid of planets to change trajectory. QM TI (see also the solution in this manual of Cramer that the TI interpretation even is valid for a Black Hole) uses offering and retarded waves, so waves into the future and into the past. Of course the paranormal factually can look into the future and into the past, so we are used to it. Science apparently uses waves that can do a handshake with a wave into the future and a wave into the past. The projections of the fusion machines into the core of a planet are opposite to the magnetic poles of the planet. In fact, according to Andre Groote the magnetic echo from the chosen planet, (can it be matched with the Quantum Handshake of QM TI ? than probably after the Quantum Handshake) will magnetically pull the gravity point of the UFO from a distance if the same gravity g is produced inside the centre of the UFO compared to the g of the chosen planet. If the gravity is not equal the UFO will not move. I just called it the "Law of Groote" conditions of causing the UFO to move! At the sixth quark level, magnetism becomes equal to gravity. That's why Andre said Magnetism is Gravity! That's why he said that Muons are created outside the UFO during steering (so you don't want to be near that UFO at the moment of steering) and you don't fall out of your chair while moving in any direction. Andre said that it feels like a comfortable soft waving movement in opposition with to the old fashioned movement of an airplane where you simply are pushed inside your chair. I am looking for a publisher. I also would like to work in the archeological field finding library discs with movies from ancient Mars hidden under the ground in China. I have a good view of where they are hidden. Nothing from the text or graphics are shown on this site may be reproduced without the prior written consent of Hans Bergman and/or made public in any form or by any means. All texts, photos and other views on this website are copyrighted. André Groote gaf in 2000 een interview bij een plaatselijke omroep. Wij hebben ernaar geluisterd en vonden het zo interessant dat we hem toestemming hebben gevraagd het interview hier te publiceren. We hopen dat jullie er van genieten en dat het jullie aanzet tot reacties. Het Interview gaat o.a. over Jules Verne en David Oistrach, aura, geest en het paradijs, karma en reïncarnatie. Er zijn van die spreuken hè, bijvoorbeeld is er een spreuk: "van het concert des levens krijgt niemand een program” Maar is dat zo? Is het zo dat mensen over leven iets weten of niets weten. Ik denk dat iedereen weet waar je vandaan komt en waar je heen gaat. Alleen, een mens heeft een veiligheidspal ingebouwd dat je niet alles weet. En dat is maar goed ook. Stel je voor dat ik precies al weet als ik een jaar of 4 ben wanneer mijn moeder de pijp uitgaat, of mijn vader! Helaas was het bij mij zo dat ik het 10 jaar van tevoren zag, zowel van mijn moeder als van mijn vader. Dat is helemaal niet leuk. Maar dat hoort wel bij het paranormale. Het paranormale ontwikkel je namelijk sterker als je als kind vrij geïsoleerd bent. Dus dat je je fantasie gaat gebruiken om het leven nog een béétje leuk te maken. En dan ontdek je dat het echt héél leuk is om geïsoleerd te zijn. Dan wil je dat ook en blijf je dat. Dan blijf je ook los van die dingen, maar je hebt wel een program. Onder hypnose kun je dat zien. Ik zal een voorbeeld noemen: Er kwam een jongen bij mij die problemen had met zijn studie. Hij studeerde viool en hij moest afstuderen. Een afstudeerprogramma aan het conservatorium in Zwolle. Op een gegeven moment zei hij: Zou het wel goed gaan met dat promotieconcert of dat afstudeerconcert of hoe je dat ook noemt. Toen heb ik hem onder hypnose gebracht en hem naar de studeerkamer gebracht van David Oistrach (red. : een Russisch violist, gold ook in de westerse wereld als een der grootste 20-eeuwse violisten), want hij moest een vioolconcert spelen van Brahms geloof ik en daar was er maar één van. Toen heb ik hem onder hypnose de originele partituren van David Oistrach laten zien. Maar, zoals later bleek, heb ik één fout gemaakt. Ik had die bladzijde omgeslagen, terwijl het al gelijk begon op pagina 1, dus die had hij gemist met aantekeningen. Dat is heel grappig. Toen zag hij onder hypnose dat hij van David Oistrach een klein gouden viooltje kreeg, hij gaf hem dat. Wat gebeurt er? Hij doet zijn examenconcert, hij slaagt met een 9. Er was tot dan in Zwolle nog nooit zo' n hoog cijfer voor viool gegeven. En hij kreeg na afloop van een vriendin die niets van dit hele geval afwist een klein gouden viooltje! Dus ja, je hebt eigenlijk wel een programma in delen, in parten. Niet in alles. Kan dat betekenen dat de toekomst van je leven al eigenlijk helemaal vaststaat, is dat zo? Ben je dan net een marionet of een pop die aan touwtjes loopt? Ja dat is wetenschappelijk onderzocht. Het begon met een soort databank van een spirituele vereniging in Engeland. Ze wilden wel eens weten wat mensen nou aan voorspellingen zouden kunnen hebben. Op een dag kwamen er heel veel dromen binnen van mensen, ze zagen dat er een enorme grote zwarte massa op hen neerviel, boven op ze. En daar kwamen er een heleboel van binnen. Korte tijd later is er in Wales een kolenlaag aan het rollen gekomen en die is helemaal over een gedeelte van een stad gevallen. Er zijn heel veel doden gevallen. Hetzelfde is gebeurd met het schip de Titanic. Dat is ook voorspeld. En ik heb zelf heel vaak dat soort dingen gehad natuurlijk. Bijvoorbeeld: ik droomde op een nacht dat ik een vliegtuig zag en die vloog tegen een berg aan. Hij vloog in brand en ik ging de mensen eruit halen. Dat was heel gek, dat hoort dan bij dat soort dingen. Die mensen zijn dood, maar je haalt het astrale lichaam eruit en je zegt: "Nou ben je goed, nou ben je veilig!" De volgende dag stond ik op en ik hoorde op de nieuwsberichten dat er in Sri Lanka een vliegtuig tegen en berg aan was gevlogen die nacht. Dus ja, ik denk dat je wel in de tijd kunt reizen. En ik denk dat wetenschappers dat maar eens bij paranormale mensen serieus moeten onderzoeken en niet zo hoogmoedig doen met hun wetenschappelijk geblabla, van het kan allemaal niet, snap je? Maar hoe zit het dan precies met de toekomst, is die nog wel te beïnvloeden? Ik denk het niet. Maar we hebben een positief gedrag en we hebben een doemgedrag, we hebben een yin en we hebben een yang. We hebben een goede kant en een slechte kant. En het schijnt zo te zijn dat mensen altijd op het laatste moment van hun slechte pad afkomen om het goede te kiezen. Een mens is in wezen een lui wezen. Als wij dus met de benzine-auto nog 100 jaar kunnen rijden, dan vinden wij het ongemakkelijk om iets anders uit te vinden, waardoor het niet op benzine hoeft. Maar als het moet, als morgen dus de benzine op is, dan zijn er mensen die het zó uitvinden. Die techniek hebben wij. Je kunt namelijk niks zien wat niet kan. Dat kán niet. Dan kan je het niet zien en je kan het niet voelen. Alleen: we interpreteren het vaak verkeerd. Ik zal je een voorbeeld geven: Jules Verne heeft heel veel voorspeld, onder andere ook een raket. Maar dat ding liet hij op kolen gaan. Dat zie je wel eens op zo' n ouderwets plaatje dat hij op kolen voortgestuwd werd, of zou moeten worden. Hij kende nog geen vliegtuigbrandstof, kerosine kende hij niet. Anders had hij wel... Maar toch gebeurt dat. Is het niet jammer dat wij als mens maar over zo'n klein deel van ons bewustzijn kunnen beschikken? Nee, je hebt maar 15% nodig. Meer heb je niet nodig, het andere deel heeft met je andere leven te maken, wat om je heen zit, wat om je heen hangt. Je hebt dus een magnetisch lichaam, dat is ook het eerste wat je als paranormaal gevoelig ziet, zo' n dun laagje energie, een beetje grijskleurig om iemand heen. De eerste laag, laat maar zeggen, die hoort bij de energie van je stoffelijke lichaam. Dan krijg je een fijnstoffelijk gedeelte, dat heeft weer te maken met je gezondheid, met je contacten in je directe omgeving, met je telepathische contacten in je hele directe omgeving. Maar je hebt ook een esoterische laag en die kan met alles contact hebben. Het kan bijvoorbeeld zo zijn dat iemand iets heel ergs heeft gedaan en in de gevangenis zit. Hij is in gedachten steeds op de plek waar hij het liefste is. Dus thuis. Dan kunnen er thuis elektronische dingen mis gaan, omdat die gedachte nog negatief is. Hij vlucht dus nog steeds voor het gedrag dat hij ooit vertoond heeft. Als hij dat met liefde zou doen, dan kan het niet spoken, maar dan kan het fijn voelen, dan kan het geuren. Een aantal jaren geleden zaten we tijdens een workshop in een hotel in een ruimte en deden daar sessies. Van die ruimte wisten wij eigenlijk niets af. Op een gegeven moment hadden we de eerste sessie gehad, we gingen koffie drinken in de pauze en kwamen om half twaalf terug en het rook hélemaal naar bloemen. Het rook heerlijk naar bloemen. Ineens wist ik het: er is een kerk hier tegenover en als er begrafenissen zijn, zijn hier de koffiekamers, óf er ligt hier, misschien zelfs wel eens iemand opgebaard. En het klopte! Doordat wij op een ander niveau met elkaar bezig waren, telepathisch, we waren psychometrie aan het doen, krijg je meer contacten in tijd en ruimte en laten die zich ook horen, zien of ruiken. Je hebt dan ook contact met een andere dimensie, waarvan wij nu denken dat het een soort "zweven" is, maar dat hoort weer bij die andere 85% die wij niet kennen. En nu wil ik even uitleggen waarom het goed is dat wij die 100% niet kunnen snappen. Je moet het ongeveer zó zien: je hebt lokale radio, je hebt radio 2, radio 1, radio 3, stel je voor dat je alle zenders tegelijk zou horen, dan begrijp je niets meer. Maar wij kunnen wél met die 15% de andere 85% punt voor punt aftasten. Alleen: je moet het weer zo snel mogelijk vergeten om weer normaal te kunnen functioneren met je buurman die ook gewoon bruine bonen met spek eet. Anders kunnen we niet met die mensen omgaan. Dan zijn we wezenloze wezens voor hen geworden. Dus: om normaal te kunnen functioneren, moet je ook een normaal lichaam hebben en ook een normaal verstand. Dan beschikken we in tijd en ruimte over die volle 100%. Wanneer zitten we dan in die tijd en ruimte, is dat alleen maar als je slaapt? Als je slaapt is alles wat je gedaan hebt weg. Wat je misdaan hebt is ook weg, ben je heel onschuldig, ben je weer echt, ben je weer puur, kan je niet liegen, niet huichelen. Je kan niets faken, je kan niets leiden, niets organiseren. Je bent zoals je bent en je hebt je daaraan over te geven, anders kan je niet slapen. Daarom kunnen mensen die ook gestrest zijn, iets te verwerken hebben, daardoor niet slapen. Die moeten dus leren, door oefeningen, om zich weer puur te voelen tijdens de nacht. Onschuldig te zijn tijdens de nacht. JE BENT ‘S NACHTS ONSCHULDIG. Je bent weer een baby, nou eigenlijk in je 100%. Iemand zei eens dat het werkelijke leven ‘s nachts afspeelt en niet overdag, is dat zo? Hoe kan ik anders ’s nachts dingen zien en naar dingen toe reizen en dingen ervaren? Ik vind het' s nachts ook vaak heel fijn. Alleen: bij mij is het sterker ontwikkeld dan bij een ander, dus ik vind het af en toe niet zo prettig, moet ik zeggen. Er zijn mensen die zeggen: ik ga dood en na die tijd is er niets meer, dan is het afgelopen. Gaan we eigenlijk wel dood, of gaan we over en gaan we verder misschien? Je gaat niet over, dat is een verkeerd woord. Je blijft gewoon wat je bent. Je geest kan niet weg. Ik zal een voorbeeld geven: ieder mens, ik heb dat aan duizenden mensen gevraagd, en allemaal hetzelfde antwoord, je ziet iemand liggen waarvan je hield. Die is dood. Dan voel je dat datgene waar je van hield weg is, uit dat lichaam is. Dus het was niet dat lichaam waar je van hield, maar van het wezen wat dat lichaam bewoog. Geest beweegt stof. Dat is het toppunt van de schepping. Het toppunt van de schepping is de aarde. Dit is het paradijs, een mooiere hemel komen we niet tegen. Ik wens nooit een katholieke, protestantse of boeddhistische hemel binnen te gaan, want dat lijkt me een hel. Dit vind ik het mooiste wat er bestaat. Dit is mijn hemel. Met de vogels, de vlinders en al de mensen die er zijn. En die maar wachten op het paradijs, de verlossing. Néé; je maakt een ramp mee, je maakt een puinhoop mee in je leven. En toch zingt de volgende dat die vogel, luister daar eens naar. Ga eens naar de boom toe die er is blijven staan. Hou hem eens vast, heb hem eens lief. Dát is leven. Maar ja, we zijn gevangen in een stad van beton en daar moet je af en toe uitgaan om te zien wat werkelijk leven is. We leven in laboratoria. Jouw huis is een laboratorium, alles komt uit buisjes. Jij denkt wel van: ik ben niet zo' n dier die in een laboratorium leeft. Jawel! Je water komt uit een buisje, je poept in een buisje, een iets groter buisje dan wel. Je wast wat uit een buisje komt. Je kijkt naar televisie, dat komt uit een buisje met een draadje. Je bent gewoon totaal slaaf van jezelf. En dat is geen echt leven en daarom word je ook eenzaam en denk je ook: wanneer begint het echte leven? Nou, dat begint buiten! In het paradijs waar je in leeft. Je bent scheel als je het niet ziet. Ook wij vogels, wij vliegen, wij muggen, wij muskusratten, wij bomen, wij onkruid, wij mooie bomen, wij lelijke bomen. Alles hoort bij ons. Je bent alles. Het is één geest, het water, het is allemaal één geest. De aarde is ook één geest, een berg is ook één geest. Je kan ook met een berg praten. Je hoort vaak mensen zeggen dat je gaten in je aura kan hebben, is dat mogelijk? Ik denk dat die mensen bedoelen dat je een zwakke plek kunt zien in een aura, een gemis aan iets, en dat kan je wél zien. Dat is ook zo moeilijk met kleuren interpreteren. Als je bijvoorbeeld groen bij iemand ziet, kunnen dat twee dingen zijn: het kan iemand zijn die van de natuur houdt, maar het kan ook iemand zijn die een tekort aan vitamine C heeft, en die te weinig groente neemt. Dus je moet precies weten wat je ziet. In de loop der jaren leer je dat. Maar een gat in de aura is onzin. Zoals die "paragnost" die tegen iemand zei: "Je had een gat in je aura, en die heb ik even dicht gemaakt, en nu kan het niet meer kapot, hoor." Dat kan niet. Dat is onmogelijk, dat is een bakerpraatje. Nee, dan zou je uit elkaar vallen als lichaam, dat gaat niet. Wij worden bij elkaar gehouden door energie. (Lacht) Dan zou er een oor van je afvallen of zo, of er zou een oog uithangen. Ik zal nog een extremer voorbeeld geven: Bij iemand die sterven gaat, is alle kleur uit de aura weg en die is alleen nog maar wit. En dat is heel mooi: Als hij sterft zie je ineens dat hele mooie witte veld verdwijnen. Dat heb ik meerdere malen gezien, want ik heb heel veel stervensbegeleiding gedaan en doe ik nog, er hebben mensen gevraagd of ik daarmee wilde helpen. En ' t is ineens weg..! Bij een vriend van mij die op sterven lag, hebben we avond aan avond de voorhoofden tegen elkaar gedaan en dan zagen we hetzelfde. We hebben een koppeling gemaakt tussen zijn geest en mijn geest en we zagen precies hetzelfde. Ik heb nog nooit zulke zeeën, oceanen, oerzeeën van zulke perfecte energie gezien. Dat was de grootste perfectie die ik ooit gezien heb. Maar ik weet niet wat dat is. En ik denk dat ik dat ook niet hoef te weten, want ik ben nu hier. Maar ik vond het prachtig! Hartstikke mooi. Hoe denk je over karma, want er wordt vaak over de betekenis van karma gesproken. Ik geloof niet in karma. Karma is een beetje stom. Er is een oud gezegde: "Grote gebeurtenissen werpen hun schaduw vooruit". Dat is ook auragenetisch zo. Auragenetisch is wat je meeneemt in de genen van je ziel. En wat zijn de sterkste emoties van de genen in je ziel: hoe een ellendig eind je hebt gehad in een vorig leven, wat je eventueel misdaan had, dát blijft hangen. Als je het ene wilt weten, yin en yang, krijg je het andere ook. En dan blijven we met onze stomme kop hangen aan wat we zogenaamd nog te "verwerken" hebben of nog "goed" te maken hebben; flauwekul! Het blijft er alleen maar hangen omdat het ooit een keer gebeurd is, maar het heeft verder geen énkele betekenis, want als je de pijp uitgaat, is je alles vergeven en vergeten en begin je als een leuk, lief baby'tje weer opnieuw. Want wat heeft zo' n baby'tje nou misdaan als het geboren wordt; met wat het in een vorig leven misdaan zou hebben, dat is toch flauwekul?! Het is zielig om zo' n kind de "kar van ma" in de poten te douwen. Ik houd daar niet van en ik geloof daar niet in. Ik geloof dat ieder leven opnieuw puur begint. Ieder leven heeft de drang van een zaadje dat, als het ergens op het beton of tussen de straattegels valt, en daar zit iets zand en er komt iets vocht, dan weer uitgroeit tot een heel mooi grasplantje. En zo zijn we allemaal. Betekent dat dan dat reïncarnatietherapieën geen zin hebben? Ik kan me voorstellen dat je dat soms bij mensen moet weghalen omdat het te zwaar is gemaakt door ervaringen in dit leven. Mensen blijven ook snel hangen aan de ellendige dingen die ze mee hebben gemaakt en kijken weinig naar de mooie dingen. Je kan zeggen: "Mijn zoon is doodgegaan, of mijn vader is doodgegaan", maar hij is óók op een dag geboren, kijk daar eens naar! Dan snap je beter wat een nieuw leven beginnen is. En hang eens niet zo' n treurkrans op een graf, maar plaats er een balletdanser op of een balletdanseres en ga dansen en lachen. Geef blauw licht, geef nieuwe energie. Het is allemaal zo triest! Weet je, dat soort denken hebben wij van ons Christendom overgehouden en daar moeten we vanaf. Vijfhonderd jaar inquisitie hebben ons bang gemaakt. We hebben geen schuld, niks. Seks is mooi, seks is fijn, ' t leven is fijn, ' t leven is mooi, nieuwe dingen creëren is mooi en de dingen die je ooit negatief hebt gedaan in een vorig leven zijn je allang vergeven. Daar hoef je niet mee te zitten. Dat is alleen maar treurig en daar maak je anderen treurig mee en daar houd je andere mensen mee op een afstand. Dat is toch zo. Je ziet ze wel eens lopen van: "hu... nou...!" Lách dan! Doe die test, zoals ik die vroeger ooit heb gedaan: Op straat lopen en bewust denken: Vandaag is mijn winkeltje gesloten. Ik ben chagrijnig, niemand zegt me wat. Is ook zo; dan zegt niemand je wat. Ga dan met de gedachte de straat op: Ik ben vandaag open, 't winkeltje is open en ik heb allerlei leuke dingen te verkopen. Dan zegt iedereen je goedendag en je hebt een blije dag, zelfs als het regent. Maar wat allemaal wel zo is, natuurlijk, en dat ben ik vergeten erbij te vertellen, je leert van dié emoties dat je het nooit meer moet doen, om nog eens een keer zo' n leven te hebben, met zo' n herinnering die zwaar blijft hangen. Dát natuurlijk wel. Hoe moeten we ons leven na de dood voorstellen, bestaan er bijvoorbeeld nog kleuren of zijn er nog relaties? Als het leven een symbiose is tussen een eitje en een zaadje, dan ben je pas weer tot leven wanneer die twee tot elkaar komen. Als je dus dood bent, ben je of een eitje, of een zaadje, dus je bent niet in symbiose meer met de stof en geest tegelijk. Dan heb je wel een voorbereiding voor een nieuw bewustzijn, maar dat weet je pas als je weer leeft. Voordat ik weer in dit leven geboren werd, was ik in het ghetto van Warschau en ik ben daar bij een kerk in mijn rug geschoten. Daar heb ik geen haat aan over gehouden, alleen maar liefde gevoeld naar het land waar ik heen wilde, dat land was het Nieuwe Israël. Het Nieuwe Israël zegt voor mij niet Israël, maar het land waar je vrij bent, waar je jezelf kunt zijn, waar geen zinloos bloedvergieten is. Dus vier, vijf jaar daarvoor (voor ik opnieuw geboren werd, red), leefde ik nog dat andere leven en toen zat ik bij mijn vader op de schouder te kijken naar een optocht in Groningen. En het is ook bewezen dat dat zo was. Mijn vader heeft daar gestaan en die optocht was er ook. Dat heb ik ook beschreven aan mijn vader. Niemand snapte er een hele hol van hoe ik dat kon weten. Ik was al heel jong uit een soort veiligheidssysteem, of heel snel tegelijk in twee levens, om het niet zo zwaar te hebben in het leven waar ik vermoord werd. Zo ziet het er eigenlijk uit. Er is vaak een vraag over die tussenfase, in die tijd dat het nog langer duurde, dat er minder mensen waren, reïncarnatie veel langer duurde. "Hoe kan het nou dat het nu zo snel gaat en vroeger zo langzaam?". Omdat er nu meer mensen tegelijk zijn, dus het gaat nu veel sneller. We zijn nu, denk ik, met net zoveel mensen als ooit een keer in de Atlantis periode. Invallen van de Duitsers in ons huis, het weghalen van mijn vader, dat wist ik allemaal. Dat waren hele rare dingen. Heel veel wil ik er niet over kwijt, misschien schrijf ik dat ooit nog wel eens op, maar ik wist, achteraf gezien, een heleboel dingen waarvan mijn ouders zeiden: "Hoe kan je dat nou weten?". Maar ja; een katholiek gezin, nog knielen voor het Mariabeeld in de meimaand en in de oktobermaand met de blote knieën op de kokosmat en dan bidden. Onzin natuurlijk, flauwekul, maar daar moest je met het paranormale niet aankomen, alhoewel die katholieke kerk natuurlijk vol met paranormaliteit zit. Jezus was zelf al een paranormaal gebeuren. Wat denk je van al die heiligen met al die wonderen? Kun je tegelijkertijd in verschillende reïncarnaties leven, of kun je tegelijk verschillende levens hebben? Ja dat geloof ik wel. Ik heb ooit een verhaal aan mijn moeder verteld, toen was ik heel klein, het was in de jaren 50, daar had ik zelfs nog nooit van gehoord, maar dat zag ik dan zo. Ik zei tegen mijn moeder: "Als een vrouw nu bevrucht zou zijn door een buitenaards wezen, (en daar bedoelde ik toen waarschijnlijk mee een esoterisch wezen of iets wat je in een vorig leven was) en die heeft tegelijk tien andere vrouwen bevrucht en je weet als je geboren wordt dat je elkaar nooit tegen mag komen omdat je ieder je eigen taak hebt. Is dat dan niet eenzaam dat je je broers nooit mag zien?". Mijn moeder was er helemaal verbaasd van: "Hoe kom je daar nu bij?". Tsja, zo voelde ik dat. Dus: de broers, dat ben jij zelf, of iemand die je heel goed gekend hebt of waarvan je gehouden hebt en dat noem je tweelingziel, of dubbelziel. Ik heb dat ook wel eens met mensen bij mij in de praktijk, ik ervaar ze al eerder als tweelingzielof duoziel, terwijl die ander daar nog nooit over nagedacht heeft en het wel een beetje vreemd vindt dat hij dat zo voelt. Maar hij kent het niet en vindt het een beetje eng. Dan heb je twee kansen: of ze komen nooit weer, of ze lopen je deur plat. Ja, dat kan. Een UFO fenomeen is ook een beetje vreemd, want als je nagaat, in de jaren dertig hebben ze straaljagers gezien boven Scandinavië die nog niet uitgevonden waren. Wat vind jij ervan hoe de mensen met elkaar omgaan in deze wereld, want we leven zo ontzettend hectisch. Ik vind het zo eenzaam. Ik heb laatst een soort gezegde gemaakt over de jeugd. "Waarom heeft de jeugd zoveel haast om oud te worden?". Als je nou bijvoorbeeld mensen ziet die ouder worden en in één keer weer hun tuin ontdekken en hun moestuin. Dat wil dus zeggen: Hoe ouder je wordt, hoe bewuster raak je van het feit dat je een keer dood gaat. Als je jong bent, ga je nooit dood, blijf je eeuwig leven, toch? Dat is de jeugd. Vaak hebzuchtig, agressief en ongeduldig. Kijk; internet is leuk, maar dan hoef je toch niet de hele dag achter dat stomme ding te zitten. Dan kom je toch nooit meer bij iemand in huis en geef je niemand meer een knuffel. Dat wil ik niet. Ik wil ook leven, ik wil iemand zien, ik wil iemand voelen. Ik wil lucht zien, ik wil buiten voelen. Straks ga je nog met je laptop naar het strand om bruin te worden. Daar kan je niet meer zonder, anders word je niet bruin, denk je dan. Ik vind dat zo'n onzin allemaal. Auto's ook: Je kan ook wel eens een keer op de fiets gaan of gewoon je eigen straat uitlopen, daar staan ook hartstikke mooie bomen en planten. Overal staan ze wel, gelukkig. Overal zie je vogels, waar je ook bent. Dus ja ik vind het zo jammer! Rustig... rustig.....! Je bent eeuwig... dus waarom zou je je haasten? Mensen worden allemaal opgefokt. Ik zou een ander radiostation willen hebben waar leuke dingen gebeuren, waar mooie dingen gezegd worden. Ik vind het prima wat mensen allemaal doen, want als je housemuziek ziet bijvoorbeeld, die gaan weer naar de oerdansen toe, van die rimboetoestand. Dus die gaan eigenlijk terug naar hun oerbron. De jeugd is heel goed bezig, die is veel dichter bij de oerbron dan de volwassenen denken. Die denken: Oh de jongeren, dat lawaai en dat gebonk! Ja je wordt er doof van, maar je bent wel bezig met de oerdrang. Dat je niet horen en zien wil wat die ouderen van jou verlangen en vergen en eisen allemaal. Dus de jeugd is best wel goed bezig, het gaat wel een stuk beter, geloof me maar! Bij alles wat ik voel of doe, voel ik me indiaan, met de toespraak van Seattle als leidraad voor mijn leven. Ik raad iedereen aan zijn toespraak Hoe kun je de lucht bezitten, een indiaanse visie op het beheer van de aarde te lezen. De eerste keer dat ik met deze toespraak werd geconfronteerd, was tijdens een televisie-uitzending van de NCRV. Onder begeleiding van prachtige muziek en zijn toespraak, die een voorspelling mag heten en een waarschuwing is ten aanzien van de aarde waarop wij samen leven, liet men daar zien hoe het was en wat ervan geworden was: vervuild water, levenloze woestijnen, eindeloze vuilnisbelten, stalen torens en andere landschapvervuilende elementen. Je kent het wel: kijk maar om je heen. Ik zat er met tranen in mijn ogen naar te luisteren en te kijken. Het was alsof ik het zelf gemaakt had, het nog ergens in mijn ziel verstopt zat waar ik het - als ik dit niet ooit gehoord had - nooit meer had kunnen vinden. Als klein jongetje droomde ik altijd van een woud met hele dikke bomen, waarachter ik me kon verstoppen. En van mooie zilverkleurige meertjes en glooiende heuvels. Begin tachtiger jaren zorgde het lot ervoor dat ik op een plek kwam die ik onmiddellijk herkende. Het was de plaats waar ik ooit de eenheid met de natuur zo sterk ervaren had, dat het mij nu nog steeds de kracht en de moed geeft om te blijven hopen dat wij eens van onze rotzooi zullen afkomen. Zoals de westkust van Amerika, Noord-Californië, de Red Woods die ik, als ik erover praat, ook steeds weer ruik. De heerlijke geur die de bomen verspreiden is het grootste genot wat een mens kan opsnuiven. Het hele gebied van Californië, Oregon tot Wahington-state, voelde ik als mijn land. Met het land waar ik eens stoffelijk één mee was, heb ik nu geestelijk weer dezelfde band. In de staat Washington ligt ook Mount Helen. Met deze berg voelde ik tijdens mijn bezoek een hele vreemde betrokkenheid. Ik voelde haar aan als een levend wezen dat tot mij sprak. En dat kon ook niet anders, want naast Mount Helen lag een prachtig meer, Spirit Lake, met zilverdennen erom heen gegroepeerd. 'Where the spirits of the Indians dance as lights in the night', zoals menig reiziger langs de Chuckenuttrail uitrustend bij het meer in het donker de lichtjes op het water zag. Deze spirits vertelden mij ook wat. Het was september. Ze vertelden mij van een grote knal, een enorme explosie die zich zou voordoen binnen acht maanden en vijf dagen vanaf dat moment. De mensen die ik mijn verhaal vertelde, keken mij verbaasd aan. Dat zou toch niet kunnen? Zo'n rustige vulkaan als Mount Helen? Nee, dat geloofden ze niet! En het gekke voor mij was dat ik tot op dat moment niet wist dat Mount Helen een vulkaan was. Ik had alleen gehoord wat de berg en het meer mij vertelden. In mei daaropvolgend belden vrienden uit Portland (Oregon) en vertelden dat de ramp had plaatsgevonden, exact op de vijfde dag na de achtste maand. De stad Portland was overdag net zo donker als midden in de nacht. De as daalde overal neer; de rivier vulde zich met boomstammen, vernielde bruggen en bedolf mensen. Een oude zwerver met zijn hond was een gewaarschuwd man, maar hij geloofde de boodschap niet. Er is nooit iets van hem, noch van zijn hut teruggevonden. Het landschap ziet er nu uit alsof er een atoombom is gevallen. Iedere wereldburger zou daar ter plekke moeten gaan kijken om ervan doordrongen te worden met wat voor afschuwelijke dingen wij bezig zijn. De hoed van Madame Helen is er af en deze hoed nam een gigantische hoeveelheid bos mee. Van al dat hout had men 250.000 huizen kunnen bouwen. Het land van Seattle heeft er een kale plek bij, maar wel een hele vruchtbare. En dat kun je van andere kale plekken op deze aardbol niet zeggen. Moet er altijd eerst een klap komen voordat de mens wijzer wordt? Of geeft hier de natuur ook een waarschuwing voor het te laat is? De boodschap van Seattle heb ik in ieder geval goed begrepen: beplant deze vruchtbare aarde met jouw liefde, zodat de nieuwe aarde langzaam maar zeker zal terugkeren. André in zijn "Voorwoord van de schrijver" uit zijn boek Parazicht © 1993. De dag nadat ik de nieuwsbrief voor de werkweek heb gemaakt met het bovenstaande stukje erin, blijkt Mount Helen zich na 24 jaar stilte opnieuw te roeren. Er hebben zich dikke rookwolken boven de vulkaan gevormd. Opmerkelijk, zou dit een nieuwe waarschuwing zijn? In de video van NASA zien we hoe rondom de Mount Helen over de jaren heen de bomen weer terugkeren. The 1980 eruption of Mount St. Helens in the state of Washington leveled surrounding forest, blasted away more than 1,000 feet of the mountain's summit and claimed 57 human lives. Landsat satellites have tracked the recovery of the surrounding forest. This video shows a timelapse of the recovery, with annual images from 1979-2011. Een cliënte van André zei tot verbazing van André van 27 februari 1982 een voorspelling van André had gelezen over de vuurwerkramp in Enschede. Het bleek dat hij toen verschillende voorspellingen in dat blad heeft gedaan wat hij allang was vergeten. Vorige week berichtten wij in Privé over de opmerkelijke contacten van de zingende paragnost André Groote met de doden. In deze reportage doet de 37-jarige Zwolse helderziende enkele opzienbarende voorspellingen. Helderziende André Groote uit Zwolle denkt lang na over de vraag. Met de hand op het voorhoofd staart hij met zijn blauwe ogen naar het plafond. Dan opeens, alsof hij de boodschap net heeft ontvangen: "Nee, de aarde zal nooit vernietigd worden door een atoomoorlog. Nooit! Er zullen zich wel gigantische natuurrampen voordoen. Te beginnen in de buurt van China en Vietnam. De gevolgen zullen zich ook hier manifesteren. Vloedgolven zie ik ook. Ook grote milieurampen zullen plaatsvinden. De mensen zullen hard moeten aanpakken, willen ze het te boven komen; maar zij die nu leven, maken het niet mee. Het ligt ver in de toekomst, de mensheid zal het echter redden. Sterker nog: ik zie een toekomst, waarin planten, dieren en mensen zich bewust gaan worden van hun geestelijke en lichamelijke bestaan. Het kannibalisme dat de mensen nu op elkaar en op de planten en dieren uitoefenen, is dan niet meer nodig. Er zal een bewustzijn komen, waardoor gedachten en wensen stoffelijk gemaakt kunnen worden. De taal is dan overbodig, want er is communicatie mogelijk via de geest tussen alles wat er bestaat. Reizen in tijd en ruimte is dan voor iedereen mogelijk. Zoals wij nu naar Amerika gaan, kunnen we dan werelden en planeten in de onbeperkte uitgestrektheid van het universum trekken. Maar een atoomoorlog? Nee, dat zal nooit gebeuren! André Groote, een Nederlandse Nostradamus? Deze Franse arts, astroloog en ziener was immers degene, die in de 16e eeuw voorspellingen deed die eeuwen later bleken uit te komen. Min of meer tenminste, want de aanwijzingen die hij gaf waren dermate vaag, dat ze dikwijls voor velerlei uitleg vatbaar waren. Een gegeven, dat zeker niet van toepassing is op de voorspellingen die zijn Nederlandse collega uit de 20e eeuw heeft gedaan. Want André's voorspellingen zijn wel duidelijk omschreven en kwamen tot nu toe tot veler verbazing beangstigend exact uit. Al tijdens zijn jeugd viel het André' s ouders op dat hij af en toe iets opmerkte, dat even later precies bleek uit te komen. Meestal echter werd het aan het toeval geweten dat André het bij het rechte eind had. Dikwijls ook waren zijn voorspellingen versluierd door kinderlijke fantasieën (redactie website: zie ook zijn biografische boek Parazicht), waardoor de aandacht werd afgeleid. Zijn broer Ben: Ik dacht vroeger altijd: die is niet goed wijs! Op den duur ging het tot je doordringen, dat het wel klopte. Je ging eraan wennen. Maar we hebben er in onze familie lang over gedaan om het te accepteren, dat André paranormaal begaafd is." Zijn zus Anneke beschrijft een voorval dat diepe indruk maakte in het gezin Groote. Een trieste gebeurtenis, die echter tevens een overtuigend bewijs leverde voor André's wonderlijke gaven. "Het gebeurde zo'n 14 jaar geleden, André was toen 23. Oom Bert was bij ons op visite en deed een dutje in de voorkamer. André was al vier keer naar hem toe gelopen om naar hem te kijken. Toen mijn moeder vroeg waarom hij dat deed zei hij, dat het niet goed ging met oom Bert. Verder niets. Een paar uur later vertrok mijn oom met mijn ouders naar Groningen om daar een paar dagen te logeren. André bleef maar over hem piekeren. Opeens vertelde hij ons: "Ik voel het, oom Bert gaat dood. Morgenvroeg om halfacht zal hij plotseling in bed overlijden aan een hersenbloeding." Wij wisten niet wat we met deze mededeling moesten beginnen. Ik had aan mijn oom die middag niets kunnen merken. Ik kon het niet serieus nemen. De volgende ochtend kwam echter de grote schok. Tegen achten belde mijn moeder vanuit Groningen op. Oom Bert was om halfacht overleden, in bed, aan een hersenbloeding! André zelf bevestigt het verhaal. "Zolang ik me weet te herinneren kon ik regelmatig in de toekomst kijken. Als klein jongetje voorspelde ik al dat ik een gat in mijn hoofd zou vallen. Een paar dagen later gebeurde het. Op een ochtend werd ik om halfzes wakker. Ik kon niet meer in slaap komen. Ik liep naar mijn ouders en vertelde dat mijn vriendje Hedwig zo-even was gestorven aan een hersenbloeding. Een paar uur later op school vroeg de onderwijzer om aandacht. Hedwig was gestorven, precies zoals ik had beschreven, om halfzes! Dat soort zaken stapelden zich op. Ik voorspelde dat de school zou afbranden. Het gebeurde. Ik kan het niet helpen, ik zie zoiets, hoor het, of voel wat een ander voelt, als hij of zij in een doodsstrijd verkeert of zelfmoord wil plegen. Dat krijg ik heel sterk door, zelfs in beelden. De dingen liggen vast in de tijd. Er valt niets tegen te doen, je kan niet ingrijpen. Ik zal een voorbeeld geven. Twee jaar geleden zocht een vrouw mij op. Ze had huwelijksproblemen. Zij gaf mij een foto van haar man. Ik kreeg beelden binnen. Ik zag problemen tussen haar man en zijn vader, en ik waarschuwde haar, dat de problemen opgelost moesten worden, omdat er anders ernstige problemen zouden gebeuren. Opeens moest ik aan een schedelbasisfractuur denken. Ik vroeg of haar schoonvader een ongeluk had gehad. Dat was niet zo. Toen zag ik wat er ging gebeuren. Een verschrikkelijk iets, maar ik durfde het haar niet te vertellen. Het was een financiële kwestie met een fataal einde. Voordat ze weg ging, vroeg ze mij of ze haar man moest verlaten. Ik voelde dat ik haar moest aanraden het voorlopig maar niet te doen. Vorig jaar zomer belde ze me op. "André", zei ze, "het is gebeurd." Ondanks alle verzoeningspogingen die ze had gedaan, was de ruzie tussen haar man en zijn vader geëscaleerd. Ze waren gaan vechten. Haar schoonvader was gevallen en bleef dood liggen. Het bewijst dat de toekomst vastligt. Er valt niet in te grijpen. Toch was het goed dat die vrouw mij opzocht en ik haar kon vertellen, dat ze bij haar man moest blijven. Want wat blijkt: zij was getuige van het gevecht. Daardoor kon ze voorkomen dat haar man ten onrechte wegens moord zou worden veroordeeld." Voorspellingen, bij uitstek een gave om rijk te worden? Van tevoren weten, wat de winnende cijfers bij een lotto zullen zijn? André geërgerd: "Fout! Ik zei al: alles ligt in de toekomst vast. Zoals ook vaststaat, dat 'meneer Peterse' de lotto zal winnen en niet ik. Laat iedere helderziende het maar proberen. Het heeft geen zin. Het zou mogelijk kunnen zijn winnende cijfers te voorspellen, maar niet de trekking, waarop ze van toepassing zijn. Iemand die het wetenschappelijk berekent, heeft meer kansen dan een helderziende. Trouwens, het interesseert mij niet. Het is zo onbelangrijk. Ik neig niet naar materie, dat heeft het leven al zo oppervlakkig gemaakt. Mensen doen wel eens een beroep op me, als ze hun portefeuille hebben verloren. Dan zeg ik steevast: wat heeft u nog over, wees daar maar gelukkig mee. Een goede paragnost gebruikt zijn gave om mensen te helpen, te genezen en niet om armbanden op te sporen. Voordat ik in Tv-privé optrad, voorspelde ik dat de mevrouw uit het publiek die tijdens de uitzending vooraan zou komen te zitten, last had van haar rechterheup. Dat kwam uit. Zo'n helderziende waarneming heeft betrekking op mensen en emoties. Dat is iets anders dan lottoballetjes." André Groote praat liever over zijn vermogen om mensen te genezen. Zo'n acht jaar al houdt hij praktijk in zijn flat in een Zwolse buitenwijk. Een drukke praktijk. Honderden mensen komen met lichamelijke en geestelijke mankementen bij hem en velen gaan opgeknapt weer naar huis. André claimt niet dat hij almachtig is en ook niet dat hij de zieke altijd van a tot z kan behandelen. Het liefst wil hij meehelpen de puzzel op te lossen. Diagnose stellen, om artsen, of in geval van misdaad of vermissing, de politie op het goede spoor zetten. Vooral met artsen, fysiotherapeuten en psychiaters heeft hij een goede samenwerking. André: "Het was zelfs een arts, die mij aanspoorde een eigen praktijk op te zetten. Sindsdien loopt het storm. Niet dat ik er rijk van wil worden. Geld is niet belangrijk. Eigenlijk ben ik een paranormale socialist, die de mensen laat betalen naar de hoogte van hun inkomen. Als patiënten bij mij komen zie ik niet alleen hun stoffelijk maar ook hun astrale lichaam. Dat is het kleurenenergieveld om de mens heen, met andere woorden, de geest. In het astrale lichaam ligt de informatie opgeslagen omtrent de ziekten die je hebt of nog zult krijgen. Ook andere gegevens omtrent ervaringen in de toekomst of in het verleden liggen erin opgeslagen. Ieder lot is namelijk alvast omschreven. Dat is niet erg. Het heeft een functie. Het feit dat iemand een misdadig leven lijdt of aan ziekten lijdt, heeft een doel ten opzichte van zijn omgeving. Het leven ligt vast, het is geprogrammeerd. Na dit leven komt er weer een nieuw leven, daar ben ik van overtuigd. Reïncarnatie bestaat! Vanuit iemands astrale lichaam wordt het gedrag van het stoffelijke lichaam bepaald," stelt André Groote. "Geestelijke impulsen manifesteren zich in lichamelijke ziekten. Zoals je leeft word je ziek. Het gebeurt wel dikwijls, dat artsen niet in staat zijn een juiste diagnose te stellen. Zij sturen de patiënten dan door naar mij. Meestal lukt het mij wel en dan ben ik blij dat ik de arts hiermee weer op het goede spoor kan helpen. Het astrale lichaam is dikwijls de sleutel tot huidige en toekomstige ervaringen. André weet er tijdens openbare avonden voor belangstellenden verbluffende staaltjes van helderziendheid mee te leveren. Hij beschrijft huwelijkssituaties en interieurs van woningen, waarin hij nooit één voet heeft gezet. Hij geeft tips inzake vermiste personen, vaak aan de hand van ontmoetingen van verwanten of foto' s. Dikwijls met succes, zoals een tijd geleden met een vermiste jongen in Amerika. Het liefst echter houdt hij zich bezig met het helpen van lichamelijk en geestelijk zieke mensen. Eigenlijk heeft hij een hekel aan voorspellen. "Wat heb je eraan? Wat kun je ermee doen, wat word je er beter van? Alles ligt toch vast," is dan zijn verweer. Maar na enig aandringen is hij bereid ten aanzien van diverse personen en zaken in de toekomst te kijken. "De situatie in Polen, die ik overigens zo'n zes jaar geleden al voorspelde, zal nog ongeveer dertien jaar aanhouden. Dan zal het hele systeem in de Oostbloklanden gaan afkavelen. Het zal zich dan van binnenuit uithollen. In Nederland zal er in de volgende eeuw een plaats door een grote calamiteit worden verwoest. Niet door oorlogshandelingen, maar door een ontploffing of iets dergelijks. Dit jaar zal er een grote brand in Nijmegen plaatsvinden. Een paar bekende Nederlanders zullen overlijden in de zomermaanden, en een vooraanstaande landgenoot wordt betrokken in een moordaffaire. Een belangrijke brug in ons land zal op instorten staan. Wat personen betreft: Premier Van Agt zal nog lang niet uit de politiek verdwijnen. Hij is een vasthouder. Hij blijft. Dit kabinet zit hij uit. Joop Den Uyl krijgt dit jaar niet de kans om te bereiken wat hij wil. In '83 wel, maar dan door toedoen van een ander. Over Wim Kan wil ik niets vertellen. Over Prinses Irene wel. Men onderschat haar sterke persoonlijkheid. Ze gaat verder, welke klappen zij ook krijgt. Sprekend en schrijvend zal zij zich in de toekomst manifesteren. De huwelijksproblemen die tot een scheiding met Carel Hugo leidden, heeft ze twee à drie jaar geleden als verwerkt. Ze wachtte alleen de juiste tijd af." André Groote raakt vermoeid. De concentratie kost hem kracht. Hij wil niet uitgeput raken. "Morgen moet ik weer fit zijn," besluit hij. "Dan wachten mijn patiënten weer op mij. Ik moet hun optimaal hulp kunnen geven. Dat is de opdracht die ik in dit leven mag vervullen." Redactie website: aanvullende informatie betreffende zijn voorspellingen over de tsunami in Thailand en Indonesia. De situatie in Polen en de voorspelling wat er met de Oostbloklanden zou gebeuren. André Groote had in 1982 vloedgolven voorspeld in de buurt van China en Vietnam. Er is een vloedgolf, een Ttsunami in Azië geweest, maar het is triest te weten dat na die vloedgolf er geen werkend alarmsysteem was ingesteld, zodat men in Indonesia (Java) weer niet wist dat er later een tweede vloedgolf aankwam. Dinsdagmiddag rond 13.30 uur gingen we met de hele groep naar een Wodanseik, oftewel een heilige eik. Een prachtige plek in het bos, niet ver van een kleine parkeerplaats. Bij de eik aangekomen, was ik toch even zo egoïstisch om er als eerste tegenaan te gaan staan. Ik kon het niet laten. En dat was maar goed ook. Daarna ging iedereen om de beurt. Het was prachtig en zeer krachtig. Maar ik was er met de kop niet bij. Alles wat er om me heen gebeurde, was 'just the side line'. Mijn voornaamste aandacht ging naar twee zaken: de auto's op de parkeerplaats, glimmend tussen het voorjaarsgroen te zien, en de eik. De eik zei me: "Er komt gevaar uit de richting waar de auto's staan". Ik zei het drie keer heel hard zonder dat er ook maar iemand van de groep erop reageerde. Toen hoorde ik wat. En bij de herdershond in mij gingen de oren nog rechter op staan. Plotseling zag ik een vreemde jongen naar mijn auto lopen en naar binnen kijken. In een reflex klapte ik een keer keihard met mijn handen. Het knalde door het bos. De jongeman keek mijn richting uit. Hij moet mij maar vaag gezien hebben tussen het bladerdak door en riep keihard: "Polizei", waar ik op dat moment niets van begreep. De rest van de groep was ondertussen ook wakker geworden en rende in een soort vreemde slowmotion naar de parkeerplaats. Ze waren met zijn drieën en al gevlucht. Bij één van de auto's van onze groep was een achterraampje ingetikt en de achterbank naar voren geklapt. Gelukkig was er niets meegenomen. Ze waren erg geschrokken van de Parapolizei. Want die rol vertolkte ik blijkbaar die dag. Tot na 10 minuten bij mij het kwartje viel. Ik had kort daarvoor een militair T-shirt gekregen dat ik die dag voor het eerst droeg. Tussen de middag had ik me omgekleed voor we naar de heilige eik gingen. Ik had het T-shirt aangedaan en een zwart sportjack. Zodoende dachten ze dat ik van de politie was. Ik wil verder ook helemaal niet weten hoe het zonder dat T-shirt zou zijn afgelopen. Ik ging met de deelnemers van de kapotte auto naar de Citroëngarage in een plaats vlak in de buurt. Dus de geplande trip van de drie meiden, van wie de auto was, kon niet doorgaan. We hadden precies genoeg auto's voor de werkgroep. De kapotte auto bleef in de garage en de drie meiden moesten bij mij in de auto. Ik vond dat we na alle commotie wel iets lekkers verdiend hadden. Dus we gingen naar een andere plaats in de buurt waar de oudste Konditorei van Frankrijk is gevestigd, voor een lekker taartje met koffie. Recht tegenover deze Konditorei staat een heel oude Romaanse kerk. Het is inmiddels een ingeslopen gewoonte (want om de beurt komt de hele groep hier wel eens voor een kop koffie met gebak) om eerst de kerk in te gaan. Niet dat daar wat te zien is, want het is eigenlijk een vreselijk saaie, nare kerk. Maar toch. Tijdens het lopen in de kerk kwam ik op een mij zeer bekend ander paranormaal niveau. Na een paar maal te hebben stilgestaan, moest ik naar een hoek toe waar ik, naar ik me later realiseerde, nog nooit geweest was, of die ik misschien onbewust wel gemeden had. Naarmate ik dichterbij kwam, werd ik overmand door zo'n intens verdrietig gevoel dat ik bijna moest huilen. Als door iets anders buitenom mij aangestuurd, liep ik de kerk uit. Zes treden van de trap af, rechts het straatje in richting stadspoort, stak over; tussen twee huizen was een doorgang. Daar moest ik langs om het stadje uit te kunnen komen. Maar het was privé-terrein en aan het einde stond een muur. Ik liep weer terug naar de kerk, vroeg de meiden om met me mee te lopen, liep naar dezelfde hoek als waar ik vandaan kwam, ging staan en deed mijn ogen dicht. Ik voelde met mijn handen de ijzeren constructie van een kooi waarvan ik wist dat die daar in de Middeleeuwen had gestaan. Ik was blind, had een bochel, liep mank en men schold mij uit voor Rumpf. Maar mijn werkelijke naam was Hans, meer niet. Ik was niet alleen in die kooi. Mijn moeder was er ook. Ze hadden het gehad met ons. Het stadje wilde ons kwijt. We werden tot heksen gebombardeerd. En we wachtten in de kooi tot de brandstapel klaar was. Die keurige nette mensen in dat keurige nette stadje - moordenaars, dat waren het toen. Wij woonden net buiten het stadje, daar waar ik net wilde doorlopen, maar waar nu de muur staat, in een soort hut, half in de grond. We waren straatarme, bange wezens die er alles aan deden te overleven. Soms was er wat meel en dan bakte ze een brood in een open vuur. Als het dan helemaal zwart was, was het binnenin gaar. Met een scherp voorwerp schraapte ze de zwarte buitenkant eraf en binnenin was het mooi blank en eetbaar. We vulden onze dagen met het zoeken naar voedsel. Vooral de jeugd sloeg mij en schold mij uit voor Rumpf. Ik kwam vaak thuis onder het bloed. En dan zei mijn moeder, aaiend: "Je bent niet slecht hoor Hans, want je bent van binnen de mooiste mens die ik ken". Nu zaten we in die kooi. En ik had niet veel zin om dat wat daarna nog zou gaan gebeuren ook te aanschouwen. Ik kon met moeite uit mijn trance komen. De hele dag bleef ik verschrikkelijk verdrietig en elke keer als ik er weer aan denk overvalt me dat verdriet weer, ook nu. Tegelijkertijd dat ik dit ervoer, zag ik een priester met een lang zwart gewaad de kerk in komen. Ik vond hem een griezel. Hij ging op onze hoogte in de kerkbanken knielen en zogenaamd bidden. Hij hield ons continu in het oog. Op het moment dat ik ophield te vertellen wat ik ervoer, stond hij op en liep hij naar de uitgang. Daar bleef hij staan. "Als het hier niet in staat, is het nooit gebeurd!" Waarop ik zei: "...en de holocaust heeft ook nooit plaatsgevonden". En foetsie was hij. We liepen met ons vieren de kerk uit en kwamen onder aan de trap, met rechts onze auto. Links kwam er ineens een non aanlopen in ouderwetse, gescheurde en kapotte nonnenkleding. Ze keek alleen maar naar mij onder het lopen. De meiden keken ook stomverbaasd naar haar. We hadden hier nog nooit een non gezien. Ze bleef naar me kijken, tot ze uit het zicht verdwenen was. Het was een verschijning. Het was niet echt - dat weet ik zeker. De keren dat ik daarna nog in het stadje ben geweest was de bevolking zeer argwanend tegenover mij. Sommigen liepen wel tot drie keer terug naar hun auto, om te controleren of ze hem wel op slot hadden gedaan en ze bleven allemaal naar me omkijken. Ik hoop maar dat Rumpf nu rust heeft met mij en ik met Rumpf. Hoe ze ook kijken, wat ze ook zeggen, laat ze maar. Als ik later met de meiden het stadje verlaat, borrelen er ineens woorden in zinnen bij ons op. We zoeken een verdwaald stukje papier in de auto en schrijven het op. Zijn verhaal, opnieuw verteld in deze tijd. wordt pijn onpeilbaar diep, om niet!, om niet! 't Is waar, mijn blik..... te leeg, maar ik zie!! We waren nog maar met een paar mensen in het hotel. De rest van de werkweekgroep zou die dag komen. Ik was net van plan om naar de ontbijtzaal te gaan, toen ik twee korte bescheiden tikjes op de deur hoorde. "Ja", riep ik, "ik kom eraan". Ik deed de deur open. Niemand te zien of te horen op de lange gang met houten vloeren. "Nou ja, 't zal wel", dacht ik en ging naar beneden om te ontbijten. Die dag heb ik met de kleine groep een prachtige, nieuwe plek ontdekt: Keltisch en voor-Keltisch. Een dal gezien met een heilige plek om nooit te vergeten. Het zat heerlijk in mijn hoofd en als ik mijn ogen sloot en eraan terugdacht, was ik terug bij het begin toen alles nog HEEL was. We zaten aan het ontbijt. Ineens realiseerde ik me, dat ik buiten een vrouw zag lopen met een hoepelrok en dat ik haar al een paar keer had gezien. Maar het kwam me zo gewoon over, dat ik op dat moment pas de rariteit ervan ervoer. En dat zij natuurlijk ook niet echt liep, maar dat ik haar alleen maar zag. Nog een paar keer verscheen ze in mijn parablikveld op de meest onverwachte momenten die dag. Op deze plek staan nu het hotel, een huis met nog de gevangenismuren erin te zien en de kerk. Van het oude dorp bleef slechts één huis staan. Dit huis viel onder monumentenzorg. Maar het dorp heeft het huis nooit zien zitten, wilde het weg hebben met de smoes, dat het gevaarlijk zou zijn. In werkelijkheid waren ze bang voor madame d'Hell die er spookte. Want de vroegere eigenaren van het slot waren ook de eigenaren van het oude dorp. "Een maand geleden", vertelde Evelien, "is ondanks veel protest van verschillende historische verenigingen in de buurt, met toestemming van de provincie, het oude huis toch afgebroken". Dus sinds een maand was Madame d'Hell zwervende. Weer net voor het ontbijt. Twee bescheiden tikjes op de deur van de hotelkamer. Ik riep: "Ja" en deed de deur open. Er was weer niets te zien. Maar Madame d'Hell, weet ik, is thuis gekomen.